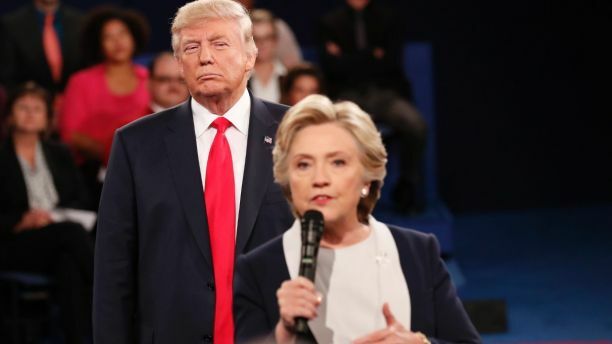 It’s been nearly 500 days since the presidential election, but even still, President Trump and Hillary Clinton haven’t stopped their bickering. Once friends — Clinton was even a guest at Trump’s third wedding in 2005 — the two New Yorkers haven’t left their squabbling behind in what was a volatile campaign season. Here’s a look at the jabs Clinton and Trump have taken at one another since Nov. 8, 2016. Rogers recently told the Senate Armed Services Committee that “we’re probably not doing enough” to deter Russians from interfering in future elections, including the 2018 midterms. “Our intelligence professionals are imploring Trump to act. Will he continue to ignore & surrender, or protect our country?” Clinton asked. During his speech before the Conservative Political Action Conference in National Harbor, Md., Trump called out the “crooked media” and the “crooked candidate,” referring to Clinton. His remark led the crowd to begin chants of “lock her up,” a common refrain at Trump campaign rallies. A day prior, Clinton retweeted conservative commentator Bill Kristol. “Two weeks ago a 26-year old soldier raced repeatedly into a burning Bronx apartment building, saving four people before he died in the flames. His name was Pvt. Emmanuel Mensah and he immigrated from Ghana, a country Donald Trump apparently thinks produces very subpar immigrants,” Kristol tweeted. In an early morning tweet, Trump called Clinton’s missing emails into question. On Twitter, Trump quoted parts of a column by the New York Post’s Michael Goodwin, which had praise for the current administration and criticism for Clinton. “Now that Russian collusion, after one year of intense study, has proven to be a total hoax on the American public, the Democrats and their lapdogs, the Fake News Mainstream Media, are taking out the old Ronald Reagan playbook and screaming mental stability and intelligence,” Trump said. A scathing, tell-all book about the Trump White House hit the shelves, and the president used his former opponent to criticize the media coverage of it. 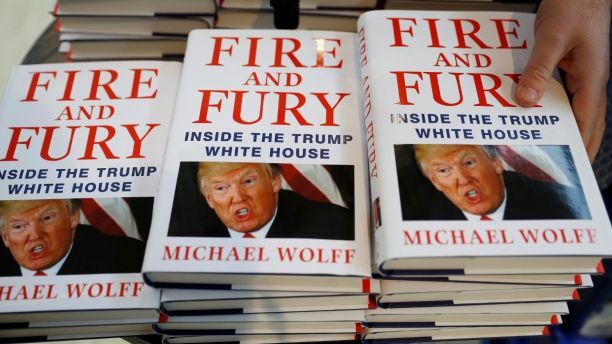 When “Fire and Fury,” a scathing, tell-all book about the Trump White House hit the shelves, and the president used his former opponent to criticize the media coverage of it. Trump slammed Huma Abedin, a top Clinton aide, in a tweet and suggested that she be jailed. Trump’s submarine reference is an apparent referral to U.S. Navy Sailor Kristian Saucier, who was imprisoned for taking unauthorized photos inside a nuclear submarine. Saucier’s lawyer has argued that his client’s one-year jail sentence was “unfair” when compared to Clinton and Abedin’s handling of classified information. On New Year’s Eve, Trump said a Clinton presidency would have lowered the value of stocks by 50 percent. Trump turned his attention to Vanity Fair after the magazine apologized for an online video that seemingly mocked Clinton. “Vanity Fair, which looks like it is on its last legs, is bending over backwards in apologizing for the minor hit they took at Crooked H,” Trump tweeted. After New York Sen. Kirsten Gillibrand called for Trump to resign due to allegations of sexual misconduct, the president took to Twitter to attack the Democratic lawmaker – and the Clintons. Trump said Gillibrand was “very disloyal to” Bill and Hillary Clinton. Gillibrand, a fierce advocate for eradicating sexual assault, shocked members of her own party in November when she said Bill Clinton should have resigned the presidency because of his affair with Monica Lewinsky, an intern. 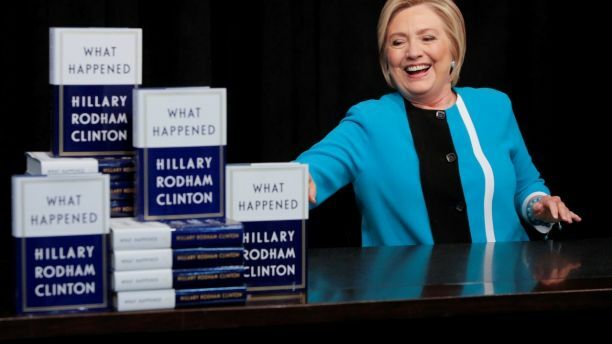 In Seattle, Wash., to discuss her book “What Happened,” Clinton blamed her presidential loss, in part, on Russian hackers influencing social media and massive voter suppression, the Seattle Times reported. While promoting her book, “What Happened,” former Democratic presidential nominee Hillary Clinton said President Trump “wants to be like” Russian President Vladimir Putin. Trump continued to use Clinton to criticize the FBI and its former director, James Comey. “After years of Comey, with the phony and dishonest Clinton investigation (and more), running the FBI, its reputation is in Tatters – worst in History! But fear not, we will bring it back to greatness,” said Trump. After Michael Flynn, Trump’s former national security adviser, pleaded guilty to lying to the FBI in regards to its investigation into Russian interference in the presidential election, Trump compared Flynn’s situation to that of Clinton’s. “So General Flynn lies to the FBI and his life is destroyed, while Crooked Hillary Clinton, on that now famous FBI holiday ‘interrogation’ with no swearing in and no recording, lies many times … and nothing happens to her? Rigged system, or just a double standard?” Trump tweeted. Clinton, too, took digs at Trump while she was at a Teen Vogue summit in California. Speaking to “Black-ish” star Yara Shahidi, Clinton addressed the presidential debate when Trump stood closely behind her as she moved around the stage, according to the Hollywood Reporter. Speaking to “Black-ish” star Yara Shahidi, Hillary Clinton said it would have felt “really satisfying” to tell then-GOP presidential candidate Donald Trump to, “back up, you creep!” during a debate. “All of that stuff he did didn’t end up hurting him that much because men are given a much broader range of emotions to demonstrate their authentic feelings,” Clinton said. Trump again brought up Clinton’s private email server on Twitter. Charles McCullough, the former Intelligence Community Inspector General Charles McCullough III., told Fox News that he and others faced blowback from Clinton allies as they investigated Clinton’s use of a private email system during her tenure as secretary of state. McCullough alleged that he was informed he would be fired should Clinton win the 2016 election. “Why aren’t our deep State authorities looking at this? Rigged & corrupt?” Trump tweeted. Trump encouraged Clinton to “get on with [her] life” while he also seemingly encouraged her to run for president again. In a video for the progressive Mother Jones website, Clinton questioned the “legitimacy” of Trump’s presidency. “I think there are lots of questions about its legitimacy,” the former secretary of state said. She also suggested that she believes Trump’s campaign colluded with Russian officials to win the election. Trump again castigated the DNC and Clinton over allegations that the party “colluded” with Clinton to hand her the nomination. Trump also noted that Sen. Elizabeth Warren, D-Mass. – who he referred to as “Pocahontas” – answered in the affirmative when asked by CNN if she believed the DNC was rigged in favor of Clinton. Former interim DNC chairwoman Donna Brazile claimed that the party rigged the primary in favor of Clinton over Sen. Bernie Sanders, I-Vt. In response, Trump alleged that Clinton broke campaign finance laws and is guilty of money laundering. Later, in an interview with Fox News’ “The Ingraham Angle,” Trump continued to criticize the DNC’s apparent involvement with Clinton. Trump used news about a controversial Obama-era 2010 uranium deal to blast the media – using Clinton to do so. In response to the revelation that Comey drafted a statement about the Clinton email investigation months before the probe was completed or he even interviewed her, Trump blasted both his former FBI director and former opponent online. “As it turned out, James Comey lied and leaked and totally protected Hillary Clinton. He was the best thing that ever happened to her,” Trump said. Trump said he would like to see Clinton challenge him in 2020. Trump later reiterated his desire for Clinton to run during a press briefing in the Rose Garden. He also criticized her for sticking up for professional athletes who have chosen to kneel during the national anthem in a sign of protest. “The really sad part of the campaign was how this horrific tape, what he said about women in the past, what he said about women during the campaign, was discounted by a lot of voters,” Clinton told the BBC. 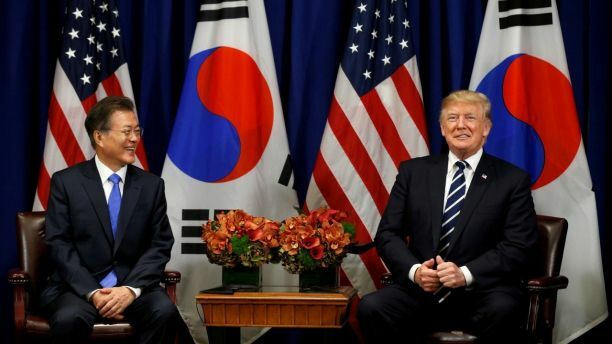 When meeting with South Korean President Moon Jae-in, President Trump praised the leader for using the word “deplorable.” Hillary Clinton called some Trump supporters “deplorables” during the campaign. In Clinton’s new memoir about the presidential election, she blamed her use of the word “deplorables” to describe Trump’s supporters, in part, for her loss. As Clinton began her book tour across the country, promoting her memoir of the 2016 election, Trump dusted off his favorite campaign nickname for her. “Crooked Hillary Clinton blames everybody (and every thing [sic]) but herself for her election loss. She lost the debates and lost her direction!” Trump said. While Clinton apologized for calling Trump supporters “deplorable” at the time, she defended her use of the word in an interview with CBS News. As the Daily Caller noted, the “deplorable” comment came almost a full month before the “Access Hollywood” tape was released. Trump called into question the ability of his attorney general and the current FBI chief to investigate Clinton. The president said Sessions “has taken a very weak position” on her alleged crimes – this time linking her to the Democratic National Committee’s server as well. As for acting FBI director Andrew McCabe, Trump said that his wife, who ran for a Virginia state senate seat last year, received $700,000 in campaign donations from Clinton. However, McCabe’s wife actually received $467,500 from a political action committee controlled by Gov. Terry McAuliffe, D-Va., a longtime Clinton ally. Dr. Jill McCabe received an additional $292,500 from another Democratic PAC. Trump addressed approximately 40,000 people in West Virginia for the annual Boy Scout Jamboree – and couldn’t resist taking a few jabs at Clinton. He told the crowd that the reason he won Michigan was because he “worked hard there” unlike Clinton. “You know, my opponent didn’t work hard there because she was told … she was going to win Michigan,” Trump said. Trump also repeated his questions about the investigation into possible collusion between the Russian government and his campaign during the presidential election continues. “So why aren’t the Committees and investigators, and of course our beleaguered [Attorney General Jeff Sessions], looking into Crooked Hillarys [sic] crimes & Russia relations?” Trump tweeted. Trump asked on Twitter why a special counsel or the attorney general isn’t investigating more alleged crimes committed by Comey and Clinton. In his tweet, Trump referenced the emails deleted from Clinton’s private server she used during her tenure as secretary of state. In an additional tweet, Trump again compared his son’s publishing of emails pertaining to a meeting with a Russian lawyer to Clinton’s own handling of her email server. As Trump’s son is criticized for meeting with a Russian lawyer who was supposed to have damaging information about Clinton during the presidential campaign, Trump defended his son on social media – while still criticizing his former opponent. Former CNN commentator and interim Democratic National Committee chairwoman Donna Brazile admitted in March 2017 to sharing debate questions with the Clinton campaign ahead of the primary town hall event. On Twitter, Trump railed on the alleged double standards for Democrats. As Trump came under fire for allowing his daughter, Ivanka, to sit in his place during a meeting at the G-20 summit, the president attempted to turn the tables on Clinton’s own daughter. In a tweet, Trump alleged that if Clinton would have let daughter Chelsea Clinton sit in for her, the media would have heralded the decision. Chelsea Clinton got in on the feud and responded on social media. “Good morning Mr. President. It would never have occurred to my mother or my father to ask me. Were you giving our country away? Hoping not,” she said. After Clinton placed the blame of her presidential loss on a variety of reasons — misogyny, Facebook and the Democratic National Committee, to name a few — Trump took to Twitter. “Crooked Hillary Clinton now blames everybody but herself, refuses to say she was a terrible candidate. Hits Facebook & even Dems & the DNC,” Trump tweeted. Clinton fired back less than an hour later, mocking Trump for an erroneous but viral tweet he sent earlier in the day. “People in covfefe houses shouldn’t throw covfefe,” she said. 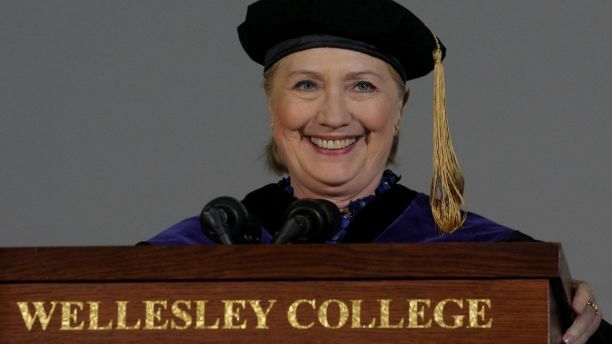 Clinton didn’t miss an opportunity to criticize the president while she delivered the commencement address at Wellesley College in Massachusetts. While delivering a commencement address at Wellesley College, Hillary Clinton jabbed President Trump multiple times and compared him to former President Richard Nixon. Focusing on national security threats from North Korea, Clinton criticized Trump for his penchant for tweeting. “If [Trump] wants to tweet about me I’m happy to be the diversion because we’ve got lots of other things to worry about. And he should worry less about the election, and my winning the popular vote, than doing some other things that would be important to the country,” Clinton said at an event in New York City. Clinton took a jab at Trump during a television interview as he continuously focused on his loss of the popular vote in the election. “He should worry less about the election and me winning the popular vote and more about other things,” the former secretary of state said. “Remember, I did win more than 3 million votes than my opponent,” Clinton added. Trump seemed to continue to compete with Clinton for the popular vote. Trump then cited an ABC News/Washington Post poll that he said showed “almost all stand by their vote” for Trump. In one of her first public speeches since she lost the election, Clinton excoriated the Trump administration without actually using Trump’s name. “These are bad policies that will hurt people and take our country in the wrong direction,” she said. Trump quoted Russian President Vladimir Putin to express his opinion on his former opponent. “Vladimir Putin said today about Hillary and Dems: ‘In my opinion, it is humiliating. One must be able to lose with dignity.’ So true!” Trump tweeted. “In addition to winning the Electoral College in a landslide, I won the popular vote if you deduct the millions of people who voted illegally,” Trump, then the president-elect, tweeted.